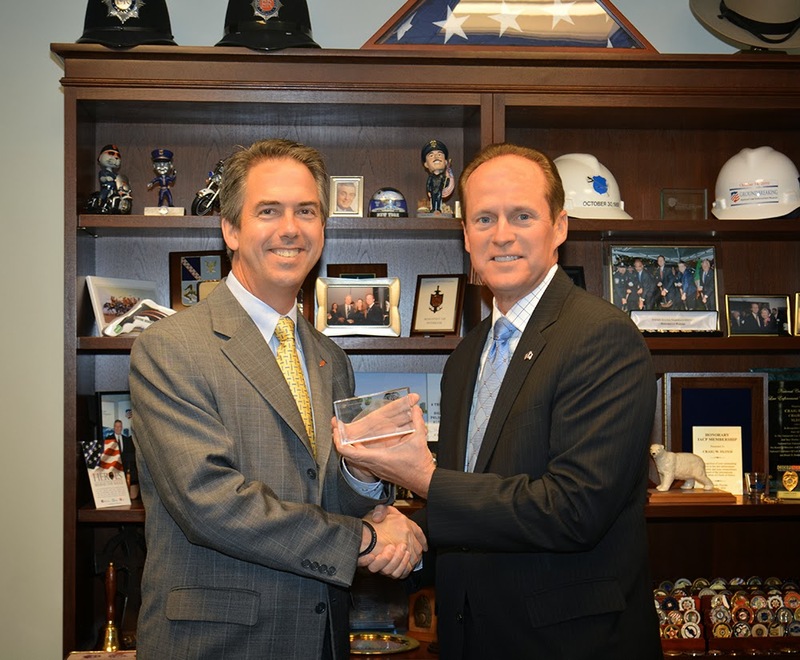 On Wednesday, October 23rd, Craig W. Floyd, Chairman and CEO of the Memorial Fund, presented a Chairman's Award to Bill Weber, Vice President–Protection Technologies at DuPont. The National Law Enforcement Officers Memorial Fund “Chairman’s Award” is presented to a deserving individual or organization that has assisted the Memorial Fund in its work to honor the service and sacrifice of America’s law enforcement officers, and has positively impacted the law enforcement profession. Mr. Weber sits on the Memorial Fund's Board of Directors and has also been a leader on our Museum Leadership Council and Chair of the Museum's Marketing Subcommittee. DuPont was our top donor when we built the Memorial. The Memorial Fund has a longstanding partnership with DuPont when it comes to law enforcement safety (they make the bullet-resistant fiber, Kevlar, used in body armor). DuPont is also the sponsor of the Museum's Changing Exhibition. Thank you to Bill Weber and the DuPont team for all that they have done and continue to do for the Memorial Fund! This Year's Ride & Run to Remember Was a Great Success! I hope you had a great time at our Ride & Run to Remember on October 12 and 13. It was an amazing event and we are so happy that you joined us! 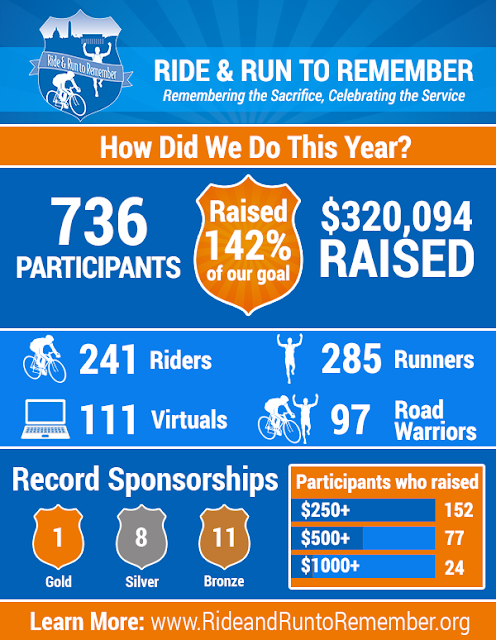 The Ride & Run to Remember raised $320,094 this year, thanks in large part to all the emails, social media posts, conversations, and our participants' personal generosity. We never imagined this year's event could be so successful and it wouldn't have been possible without you. Many of you put in a lot of time and money, and every cent you raised will go toward the National Law Enforcement Officers Memorial Fund's important mission of honoring our nation's fallen officers. It was so great to meet all of you who were able to join us in person. Thank you again and we hope you plan to participate next year.